Before the development of stainless steel, knives and forks were made of steel that rusted easily so it was important to clean these items of cutlery regularly so that they stayed shiny and bright. The forts would have been cleaned in warm soda water and then rubbed on wooden and leather boards to remove any stains. 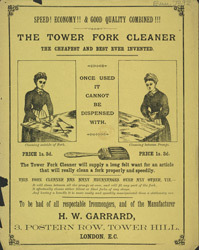 During the 19th century many gadgets were invented that helped to make life much easier for the servants and housewives, the fork cleaner featured on this leaflet is a good example.